During the month of June Didi Ananda Rainjana gave a workshop for the teachers at our kindergarten in Albania. She shared her expertise with the three teachers and the results were very good. After the course was completed I asked the teachers what they liked best and what they found most useful and they said that the visualization exercises (such as those found in our YES manual) for meditation were particularly important. In fact, I had a chance to see this in action. I went to the kindergarten and the teachers did a visualization in which everyone imagined they are a tree, deeply rooted and connected with everyone else. 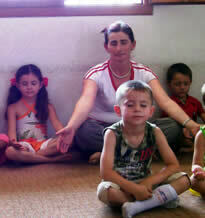 Both the teachers and the children went into deep meditation and I was impressed. The next week I wanted to try it myself. For the past eight years I have been playing songs for the children and then ending with Baba Nam Kevalam, and the children were instructed to meditate on the song and its meaning of all-pervading love. This method worked well, but there was room for improvement and I also wanted to see what would happen if I introduced some visualization exercises. So, after playing Baba Nam Kevalam, I asked the children to imagine that they were very light and all floating together on a cloud and that they should feel the love that is within themselves and surrounding them everywhere. After a short time I ended the meditation with a song, because the attention span of four, five and six year olds is not as long as an adult. To my surprise one of the most unruly children was still deep in meditation, even when everyone else had opened their eyes. This is a boy who usually cannot sit still for a minute and even wanders about between the three kindergarten classrooms. 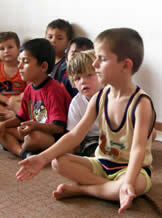 He has some learning and psychological difficulties but he really enjoyed that meditation session. This experience was really encouraging and shows that with a bit of creativity it is not so difficult for children to experience the bliss of meditation.